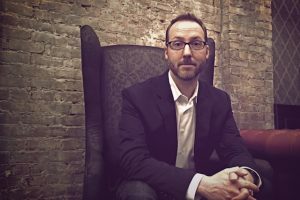 Aaron Mahnke produces Lore, an award-winning, critically-acclaimed podcast about true life scary stories. Each episode exposes the darker side of history, exploring the creatures, people, and places of our wildest nightmares. A lover of all things mysterious and supernatural, Aaron Mahnke explores the sinister stories behind true events in his critically-acclaimed podcast, Lore. From New England vampires to Chilean warlocks, his explorations into the unexplainable evoke Unsolved Mysteries, The X-Files, and classic campfire tales. A hit from the beginning, Lore averages over 6 million monthly downloads, was named Best of iTunes in both 2015 and 2016, and has been called a “must listen” by Entertainment Weekly, The Huffington Post, and USA Today. In addition, Mahnke serves as Executive Producer of the “Lore” television show on Amazon (from the producers of The Walking Dead), and the author of three supernatural thrillers: Indian Summer, Consumed, and Grave Suspicion. Now a key figure in the industry, Mahnke’s expertise on writing for audio and podcasting is invaluable for aspiring podcasters. He also delivers passionate lectures about the importance of folk tales, and legends in culture and society. Mahnke has been a featured speaker at Podcast Movement, the Boston Book Festival, and the Now Hear This podcast festival. Mahnke has written three novels: Consumed, Indian Summer, and Grave Suspicion. His series, The World of Lore, is a collection of true-life stories based on global superstitions and legends.